NCCEC: "[We] respectfully ask that you immediately remove the Ethics Commission’s emblem from your blog. That emblem was used without the permission of the Ethics Commission. Will you be able to remove it today?" STOP: "We just spent the better half of our morning reading on "fair use" of copyrighted logos, and can't find anything conclusive on-line forbidding their use in a meme, especially if the meme is factual. If you can point us to something to the contrary, in written or established law, let us know and we will gladly replace the EC logo with the simple words "NCC Ethics Commission" or similar". NCCEC: "Please remove the Commission’s emblem. You do not have permission to use it in your blog. Thank you"
STOP: "Fair Use Exemption -- U.S. copyright laws offer a "fair use" exemption for educational and research purposes as well as for satire. You may be able to use a slightly altered version of the logo if its purpose is clearly satirical. For example, putting an altered version of a presidential campaign logo on a T-shirt might be permissible. Educational uses include scholarly and research purposes, and the law provides no specifics on when an item may be used or how frequently. Instead, courts look to the effects and nature of the use and intent of the user. If you're selling T-shirts to make a profit, fair use for educational or research purposes won't typically apply". "Again, we'll be happy to remove it and discontinue its publicizing if there's something in law to the contrary, or that we are unaware of". NCCEC: "With all due respect, your blog is not an educational blog nor is it associated with an institute of education. The emblem is not a meme. Nor does your use of the emblem qualify as satire. Your use of the emblem is nothing more than an incorrect and misleading statement along with the Ethics Commission’s emblem. The emblem adds nothing to your untrue statement which surrounds it, and nothing about it is satirical. Satire ridicules fact, and you have not stated anything factual with you use of the emblem, without permission. The Commission never said what you have stated alongside of the Commission’s emblem. It is not satire; it is nothing more that a false statement which is misleading the public. As such, the fair use exemption is not available to you in this instance, and I am sure that a Delaware court would agree with me"
STOP: "We're not disagreeing with the job the EC did interpreting the code; we disagree with the outcome regardless of how it came through. No one looks at this situation and doesn't immediately call "conflict of interest!" when we show it to them. A 1st grade educated child would even point out there's a problem, or the serious potential for one. That is our point, it has nothing to do with your job or the interpretation of the code and the guidelines you must follow". "First of all, context; we never said our meme was satirical; we simply stated that was but one use of memes. What the EC did in dismissing such a blatant conflict of interest is anything but funny. Second, our blog is indeed educational, in the sense that people learn from it, from fact based reporting, on an advocacy campaign. 3rd, as said previously, meme etiquette calls for the use of quotes to actually quote what someone, or an org, etc actually said or wrote. We did NOT quote the EC. Finally, the EC did indeed send that exact message, without actually "saying" it, because they dismissed a formal complaint regarding a conflict of interest that WAS a conflict of interest. 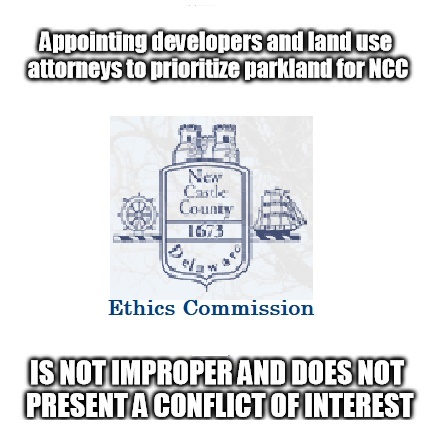 Supposedly, the ethics code "prohibits conflicts of interest and *appearance* of impropriety in the conduct of New Castle County public officials and employees", according to its mission. By dismissing our complaint, the EC did NOT see putting the developer and the seller's land use attorney in Chair positions on the Parks Transition Team as inappropriate either way. We have come to the absolute, undeniable conclusion that from Day 1, the fix was in. The evidence is overwhelming. The region's Legislators (County & State) were already in the pockets of developer interests as far back as 2011, when it was first apparent that the Sister's wanted to sell. They knew that by July 2015, when hundreds showed up at Holy Family Church in protest, it was too late for any citizen advocacy effort to stop it. What they failed to grasp was that the community wasn't stupid, and wasn't going to roll over and just go away. Once they realized the strength of the STOP movement, and the in-depth knowledge that folks now had about their filthy land-use laundry, they moved quickly to shore up everyone and everything that could be used against them and the Chestnut Hill "Preserve". 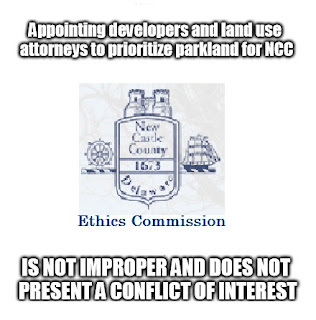 As we're seeing now, this also included the NCC Ethics Commission, members of which were appointed by Exec Meyer himself (conflict of interest #2). We remain hopeful that none of you will be taken by the region's 3 elected Legislators and Meyer himself -- the 4 of whom caused this to happen. Each is highly skilled at defense of the indefensible, and turning an argument completely around until it implicates the innocent or what's justifiable. Nothing about throwing away the Orphanage Property -- forever -- is justified, nor is 8 years of inaction on the part of the Legislators and keeping it from the public (and then Exec Gordon for a chance to save it). The evidence is clear that these "leaders" never once had the community and their constituents in mind and at heart; It would appear that the bottom line is much more important. Hopefully, opposing candidates will run and the electorate will toss them out come November this year.